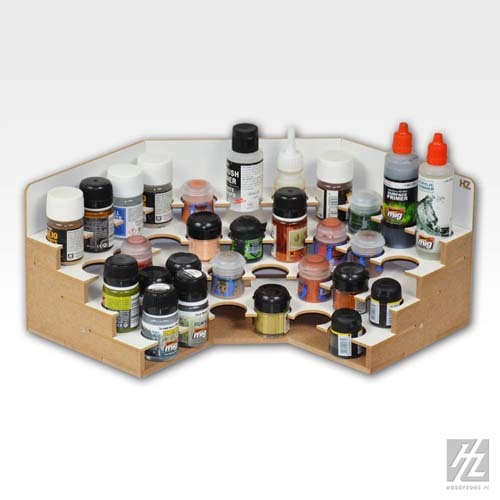 The OM06b is a bottle storage module that can work on its own but it is designed to be stacked atop storage modules that are part of HobbyZone Modular Workshop System. This module serves as a corner module to change the arrangement of the Modular Workshop System by 90 degrees and can be stacked with the OM03 and OM04 modules. Modules connect using magnets that are included and you can always change the configuration of the modules according to your storage needs. This module comes in kit form, consists of precision fitted parts and assembly instructions. Wood glue is required for assembly (not included). 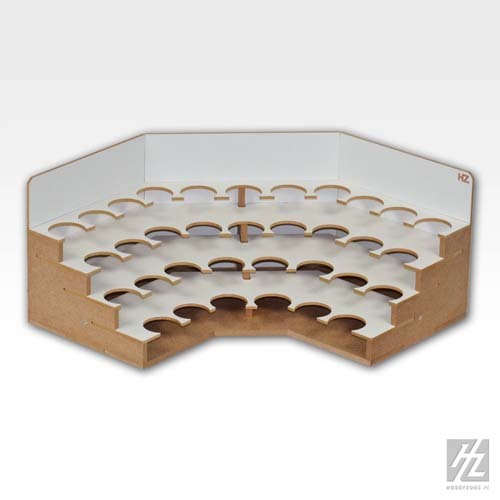 The holes in this module are 36mm in diameter and will accommodate the bottles listed below. Note: The paint tins from Humbrol, XtraColor, and White Ensign Models will fit in these holes as well but the height of the tins will make them awkward to grasp as they are only a few millimeters higher than the shelf hole. You can use this shelf unit for these tins but you might find the OM05u shelf unit more flexible for tins. The OM06b Module does not include paints, tools or accessories, pictures just show examples of use.